Minister Samuel D. Tweah and AfDB Liberia's County Director, Orison M. Amu, affixed their signatures to the document. Finance and Development Planning Minister Samuel Tweah and African Development Bank (AfDB) Liberia Country Director Orison M. Amu, on Wednesday, October 3, signed a loan and grant agreements totaling US$41.58 million for the Mano River Union (MRU) Road Project. The ceremony was held at the Ministry of Finance and was attended by Public Works Minister Mobutu Nyenpan, Deputy Finance Minister for Economic Management Augustus J. Flomo, Deputy Finance Minister for Budget Tanneh Brunson, and representatives from the AfDB. The agreement signed in Monrovia is a continuation of the AfDB's support to the regional integration of the Mano River Member States (Liberia, La Cote D'Ivoire, Sierra Leone and Guinea) as well as in support of the Liberian government's Pro-poor Agenda for Prosperity and Development. According to the agreement, the AfDB's support is also intended to consolidate ongoing roads construction by the Government of Liberia to boost economic recovery. Furthermore, the agreement named the asphalting of 20km of road between Fish Town and Kelipo in River Gee County, and the asphalt pavement of the 47.1km stretch of road between Sanniquellie and Loguatuo in Nimba County, including the construction of two markets, water facilities, and latrines along these roads as specific projects under the initiative. The signing ceremony, according to Orison Amu, represented the second phase of the MRU Road Development and Transport Facilitation Program which, when completed, will improve roads in the three MRU countries. Amu said the construction of a joint control post and a bridge linking La Côte d'Ivoire and Liberia is also planned, which would reduce transport costs, ease the free movement of people and goods, promote regional trade and overall improve the living standards of about 790,000 people. He said another expected positive outcome will be 800 new jobs over the next 2-3 years for 100 traders - 60 of them women - who will also receive training in bookkeeping. "The program will also increase job prospects for ten young graduate technicians and engineers employed at training sites related to the project. With a total estimated cost of US$87.87 million, over 48% of the total cost of this second phase is covered by the African Development Bank," he added. Amu added that the balance would be covered by a European Union grant of Euro 20.2 million and a potential loan from the European Investment Bank (EIB). 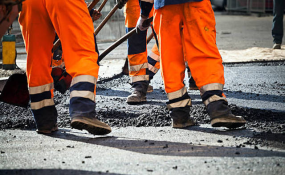 He also said that the program will be implemented from January 2019 to December 2022, and the project roads are expected to be ready for use in 2021. He said the first phase of the road program, estimated at US$108.4 million for Liberia, obtained financing in December 2014. Under this phase, 96 km of roads are being upgraded from gravel to asphalt concrete between River Gee and Maryland Counties. In addition, two joint control posts and a cross-border bridge on the Cavalla River are being constructed. Amu said the project will help open up the southeast and western part of Liberia, which will assist in the delivery of Government services such as health and education. He said the project will also open up market access to tourist areas in La Cote d'Ivoire, thereby improving incomes for people in that part of the sub-region. Minister Tweah conveyed on behalf of President George Weah the government's appreciation to the Bank for the ongoing support and plans for further support to the Government in actualizing its development agenda. Tweah also used the occasion to convey President Weah's request to the Bank and other development partners to shorten the implementation circle especially in the execution of critical development projects. Describing roads construction as "the centerpiece of the national development aspirations of the government," Minister Tweah said that the government of President Weah remains committed to improving the country's road infrastructure and therefore look up to the African Development Bank, the World Bank, and other partners to scale-up the financing for road development in Liberia. On the ongoing project, Minister Tweah called on the AfDB for more efforts in order to ensure that the observed delays are avoided. With respect to this project, he emphasized the importance of fulfilling the loan conditions for disbursement effectiveness as soon as possible, as this affects the processing of the project. He urged the Bank's executive to ensure timely implementation and pledged Government's commitment to meet the counterpart obligations as well as ensuring compliance with safeguard requirements.